Happy Thanksgiving! Or Black Friday, if you’re into that. I hope you all had a fabulous day full of awesome food and new memories with your families. At my house, we did it up like we usually do every year. We’re Dominican, so our Thanksgiving is nothing like the “traditional” American dinner. We don’t have green bean casserole, or mashed potatoes, or stuffing. Dominican Thanksgiving is actually interchangeable with Christmas dinner. The only thing that changes is the main protein; we have turkey (just like everyone else) at Thanksgiving, and pork for Christmas. Enough with the Christmas stuff, we’ll get to that next month. Let’s talk about yesterday’s dinner. My mom and I are always the main cooks in the kitchen. My sister comes and goes, but it’s mainly us two. We plan a menu a week in advanced, but my mom always adds things last minute. My mom, or Mami as I like to call her, always says that she doesn’t know how to make small amounts of food. She’s right because even though we’re just a family of four, she always make enough food to easily feed at least 12. Thankfully, our neighbors join us for dinner, which helps take some of the food off the table and also gives us that ‘family’ feel that’s necessary during the holidays. Moro de gandules: rice cooked together with pigeon peas (not pictured, unfortunately). Eggplant casserole: a layer of tempura graffiti eggplant followed by tomato sauce, canned green beans, bell pepper slices, onion slices, mozzarella cheese, another layer of tempura eggplant which is finally topped of with more sauce and a final layer of cheese. Pork pastelón aka starch casserole because it’s basically two thick layers of shredded plantains, squash, taro root that have been mixed together with other seasonings, and a middle layer of cooked chunks of pork. Potato salad aka my specialty: boiled then diced potatoes and carrots, chopped hardboiled eggs, diced onions and cubanelle peppers, mixed with mayo, salt, and vinegar. 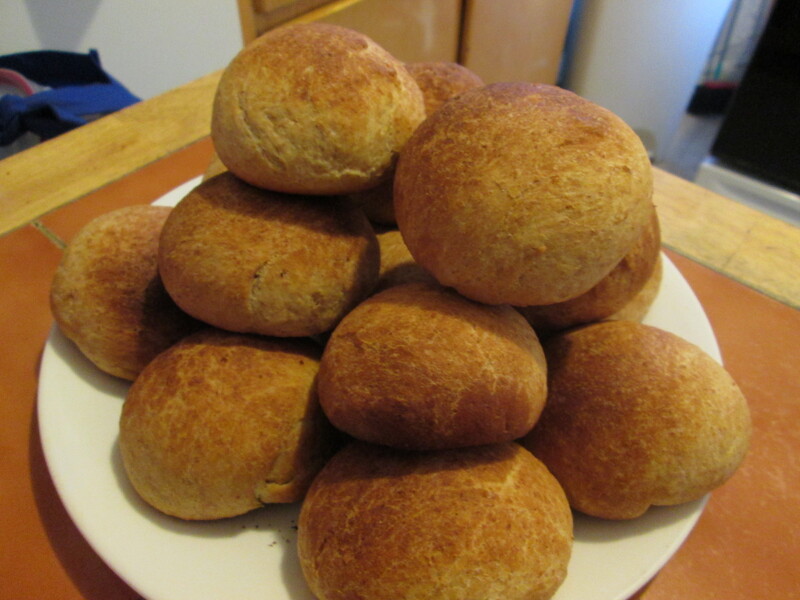 My whole wheat dinner rolls. I actually made them half white, half whole wheat. Coconut macaroon and pumpkin pie from the Shiksa in the Kitchen, which is just me trying to introduce more “traditional” items into our holiday menus. It almost always fails, as my family doesn’t always like it. The pie was awesome, though. I just wish it were more coconut-y. We also made piña colada; an amalgamation of canned pineapple rings in juice, canned pineapple juice, evaporated milk, sweetened condensed milk, canned coconut cream, and as much Bacardi as you can handle (also not pictured). Everything was awesome and I can’t wait to eat leftovers! I am just thankful for all the blessings I have and haven’t received. These past six months were kind of tough on me mentally and personally but I know that maybe things were just supposed to be this way for me, and that good things do come to those who wait ( I just need more patience). I’m also thankful for my mom’s awesome cooking! Again, I hope you all had a great Thanksgiving and that you creatively enjoy your leftovers! August is coming to an end, and it’s already feeling like fall. Besides associating the fall with anything and everything pumpkin, fall to me means quality carbs. I’m talking bread, cookies, pies, muffins, scones and anything in between. I mean, how can you not associate fall with carbs? It is the beginning of the baking season; starting with Halloween. Besides it marking the beginning of the holidays, the fall also brings a welcome chill into the air that can be easily remedied with a warm, baked treat. Naturally, humans tend to bulk up a bit for the coming cold season and anything carby and baked is obviously the right answer. 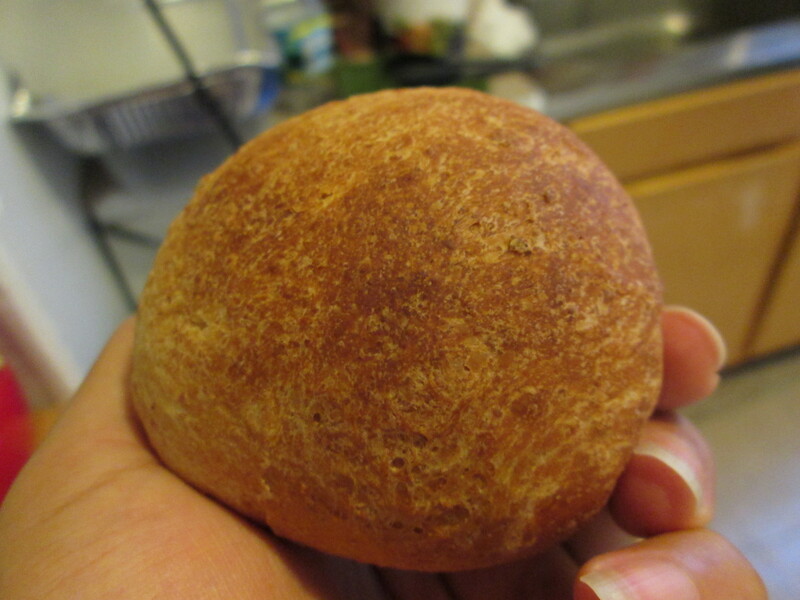 I started baking bread two years ago. At the request of my mom, I baked dinner rolls for Thanksgiving and Christmas. I looked for recipes that seemed easy enough for me to do in an afternoon and that did not require a mixer. I did find recipe gems that required a mixer but I attempted them anyway, even without the luxury and ease of one. While I am still pining for a 5-quart tilt head KitchenAid (in either Cobalt Blue or Silver Metallic) with all the accoutrements, I brave these recipes and complete them by hand. Bread dough is a finicky thing; more so if you’re a beginner, are sans mixer, and still don’t know what you’re doing. The most difficult step for me is the kneading. Besides not having any counter space (at all) to actually roll out and knead dough, my dough always comes out stickier than required. I know that with a little more kneading, the dough will stop feeling tacky but I find it hard to do so with a hand covered in dough whilst kneading in the bowl. I have to say, despite the challenge, I have learned how to knead dough in a bowl and figure out when it’s ready to rest and rise. This recipe is usually my go to. It’s easy for beginners with or without a mixer and is easily adaptable. I have tweaked it many times, each with deliciously fluffy and sweet results. It’s great with a little softened butter, or by itself, straight out of the oven. There’s nothing like the warmth of freshly baked bread to welcome the incoming fall (and baking!) season. Add in the flour mixture to the wet mix a little bit at a time, until fully incorporated. Knead dough on a lightly floured surface, adding more flour if needed, until the dough is no longer sticky. Place dough in a lightly greased bowl. Cover and let rest for 1 hour. Punch dough down and portion into 16 rolls. Place on baking sheets lined with parchment. Cover and let rise for 1 more hour. Preheat your oven to 375F. 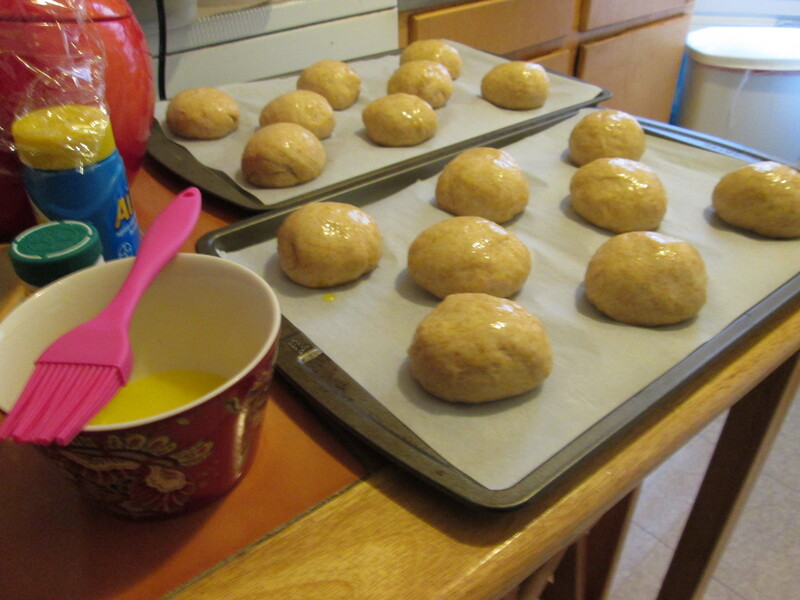 Brush dough balls with melted butter and bake your rolls for 10-12 minutes. The original recipe calls for only all-purpose flour and only 1/4 cup of sugar. Feel free to use either amounts of sugar, or types of flour. I weighed my dough prior to portioning, to ensure even rolls. You don’t have to but if you’re a stickler for accuracy like I am, you totally can. Make sure your water is not too hot! Water above 110F/45C can kill the yeast. Test the water by touching it, making sure it’s only a little warmer than body temperature. Or use your thermometer, if you have one. These rolls can easily be frozen. Flash freeze your rolls on the baking sheet after forming them. Thaw and let rise an hour before baking. The original recipe also calls for heating up your oven to 400F. I advise against this because it has led me to burnt bottoms and pale tops. Check the temperature of your oven to make sure it doesn’t run as hot, and keep an eye on your rolls! If they still have pale tops, put them under the broiler for 2-3 minutes.